Discover just what the typical tuition is for U.S. students around the nation, and how Bryant and Stratton College - Parma measures up. Knowing the fees and tuition related to going to Bryant and Stratton College - Parma lets you plan a budget for 4-6 years. Examine the numbers following to know how Bryant and Stratton College - Parma's price measures up to other colleges and universities and if you need to plan for a rise in tuition. How Does Bryant and Stratton College - Parma Contrast With Other Colleges? The next table shows how Bryant and Stratton College - Parma compares to other colleges nationally, regionally and by state. Full-time undergraduate students at Bryant and Stratton College - Parma were charged $17,326 in fees and tuition in the 2017 - 2018 school year, prior to modifications for financial aid. Of that number, the price of tuition came to $16,891. $435 was the price of fees. Regrettably, this college doesn't offer any reductions to residents of the state. The tuition and fee costs cited here don't include room and board, which can drive up your expenses. Bear in mind many students obtain financial aid and scholarships that decrease their total cost. View the table below to find 2017 - 2018 academic year costs. For more details, click Bryant and Stratton College - Parma Part Time Tuition & Fees. There continues to be an increase of 2.2% in Bryant and Stratton College - Parma fees and tuition for out-of-state students in the past five years. Tuition expanded by 1.8% and fees expanded by -1.4%. This school year, undergrads can anticipate paying $17,700 if the growth keeps up. Because of price growth, the total expense of a four-year degree from Bryant and Stratton College - Parma would be $73,128, and the total cost of a two-year degree would be $35,783, not including added charges such as books, transportation, and room and board. 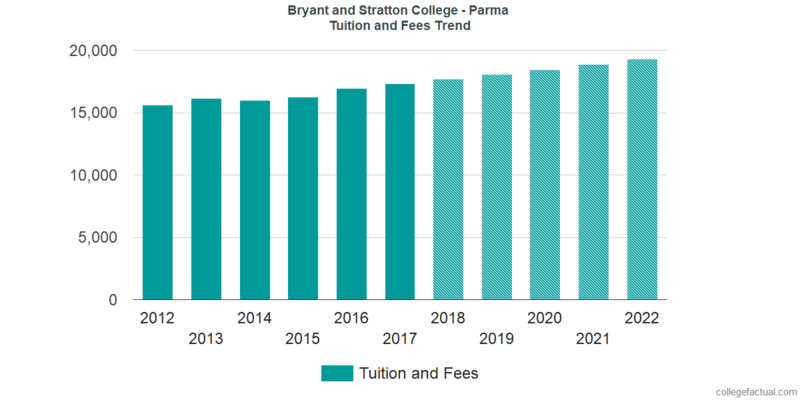 The subsequent chart reveals predicted future fees and tuition for undergraduate students at Bryant and Stratton College - Parma. Take note of just how much the tuition and fees are rising each year. At many colleges students will wind up paying a larger price for their last year of school than they did for their first.